What idea do you plant in the minds of future potential members? Truer words haven’t been spoken in a movie since “Hakuna Matata” was said in the Lion King, but that’s a story for another day. It all starts with an idea. An idea planted in someone’s mind by our actions. From my perspective, in the case of fraternity recruitment, it started with the idea that no man is an island, and it went on to develop into the fact that we need each other to succeed. What ideas do you plant in the minds of students at your school? What ideas do you subconsciously tell potential members about through your actions (and your words)? Do we tell them about our parties or our brotherhood development? Do we tell them about our leadership opportunities and academic standards or the state of our sorority relations? Do we tell them about our love of T-shirts and chanting? Or do we tell them about our organization’s values? What is it about our values that makes us love them so much and at the same time be afraid to share them with others? We’re hiding our secret weapon of the subconscious mind, when we should be unleashing it upon unsuspecting potential new members and watch them drop like flies into our lifestyle of fraternal excellence. Values – sell your product as it is supposed to be and you won’t have a problem attracting the right kind of customer. When you look back as an alumnus of your chapter 2 or 3 years from now think about the type of members that you want to see and then think about what’s going to attract them. Plant the idea of your fraternal values in action and you’ll see the results be out of this world. Plant the idea of excellence in their head and let it grow – remember recruitment is not just one week, act the way the way you should all the time and let the character of your organization infect your community. Recruit on a reputation that you earn everyday. To contact Ring of Phire Members, E-mail RingofPhire@PhiredUp.com. There’s no denying that Phired Up primarily teaches recruitment. We most often teach cause-based membership organizations how to engage more people in their cause. That manifests in a lot of different ways, but most commonly, into fraternity/sorority recruitment training. What we find, upon investigation, is that there is not a “system failure” – that the process to recruit people isn’t necessarily broken, but that their network isn’t large enough. Put simply… they don’t have enough friends. Non-Greek friends to be more specific… they don’t have enough to be successful at engaging more people in their cause (their fraternity or sorority). Social aptitude is the missing link to their success. These students – some of the best and brightest – lack social aptitude (a combination of social skills, an understanding of the importance of networking, and the drive to connect with people intentionally) and, as a result, they lack confidence to make friends, talk to strangers, and engage with new and different people – to find more people for their cause. Directly because of this, we started emphasizing more and more of the Social Excellence component in our sorority recruitment training. Amazingly, almost on accident, something miraculous happened – women are finding confidence – they have started to believe in themselves and their social abilities. There is a beautiful transformation that is happening within these women, and as a result, a transformation in their organization. It has become more and more clear to me how much, the Social Excellence training we are doing is impacting the confidence of the women we are teaching it to – and as a result impacting their organization and their recruitment results. There’s a group of wonderful women that I began working with in March of this year at a university in California. These women were struggling in recruitment – in comparison to the other groups on campus – mainly because, in my opinion, they didn’t believe in themselves – individually or collectively. They believed that they were a failure because everyone treated them that way. But these women aren’t failures: They are highly intelligent, beautiful, fun, caring, open and authentic women – with (sadly) very low self-esteem. We focused much of our education, first, on teaching these women Social Excellence – teaching them social skills, so they knew how to make friends. In the process of doing that… the magic happened: These women found confidence. They didn’t just find confidence though - these women found more. Suddenly they were excited, outgoing, proud, and engaging. They believed in themselves, their abilities, and in each other. There was energy, life, laughter, and lots of noise in their chapter house. These women learned basic social skills like how to shake a hand and to keep conversation flowing, but they also learned about being curious, authentic, generous, and vulnerable. They learned what it means to be the best version of themselves. They learned how to be open, kind, and, of course, bold. The transformation has been remarkable. Women who were once uncomfortable talking to me are now texting me to let me know they talked to the cute boy they sit next to in class – and set a time to have coffee with him. They’re sending me emails sharing the story of being curious about a book they saw someone reading on campus – so they walked up and asked – and made a friend. Recently, I made a visit to campus to work with them. I gave them several “challenges”. One of the challenges was, “Make eye contact with, smile at, and say hello to 25 strangers.” Text messages poured in that day about how good it felt to make someone’s day – to get them to smile back. “The dare I chose to complete was to look for a facebook friend who I don’t really know or haven’t really talked to and get to know them. I chose a girl whom I had met the first week of school randomly. We exchanged numbers but never ended up hanging out, and I hadn’t talked to her since then. So I texted her and asked if she wanted to get lunch this week. We met yesterday for around 45 minutes, and even though I had been scared that I wouldn’t remember what she looked like or that it would be awkward, it really wasn’t bad! I found that conversation flowed pretty easily, partially because she is really nice and is interested in joining band, which I’m a part of, but also because I used some of what I had learned about making conversation during rush and working on it as a chapter. I’m so glad I did this because we found some things that we have in common and are now planning to go to some events together. We get along very well and I can definitely us growing closer as time goes on. I look forward to meeting some of her friends and introducing her to mine, because it’s very important to me that I have friends in different groups. At first I thought this dare would be too challenging and there wasn’t anyone who would be willing to go along with it, since I haven’t experienced anything like it before. But it showed me how accommodating people are if you just make a little bit of effort. I am proud of myself for completing the challenge and I know I’m going to continue to reap the benefits! These women would have never even humored me in this request in March when we started working with them. They would have been too shy, with too little confidence to even consider talking to a stranger. Now they meet and engage with new people everyday (trust me I get the text messages). We gave them permission to be their true authentic selves, to challenge each other to be the best version of themselves – everyday, and taught them the skills necessary to be the best them. These women are confident. They believe in themselves. They believe in each other. Because of this renewed belief in themselves, they are able to more easily find more women on campus to engage in their cause – in their sorority. At Phired Up, we exist to prepare the world’s organizational leaders with the patterns of behavior necessary to consistently increase the quantity of quality people they engage in their cause. We believe that Social Excellence training gives women the skills to feel confident in life, in business, and in relationships. We believe Social Excellence training teaches women to be bold and confident. We believe when women feel confident it empowers them to realize their dreams and inspires them to make a difference – to engage more people in their important causes – whether it’s sorority or otherwise. P.S. Our recently announced partnership with The Confidence Coalition is a prime example of this connection between Confidence and Social Excellence. We’re incredibly excited about it! That quote might be the most overused quote in history when it comes leadership, management, and personal development education. As a professional speaker, I actually go out of my way to NOT use that quote since it has been so overdone. Except for this… it’s pretty smart. We believe that EVERY PERSON IS AN ORGANIZATION WAITING TO HAPPEN. See, our company’s focus really is helping organizations grow because we believe in the power of a “small group of thoughtful, committed citizens.” That’s what changes the world! We want to change the world, so we help people (lots of them) organize around a purpose (a good one). Since the beginning of our company we’ve taught about the magic of PEOPLE and PURPOSE. These are the two fundamental elements of any membership organization. Get several people gathered together around a shared purpose and you have an organization. No people? Just a fluffy idea. No purpose? Just a crowd. Put them together though, and you’ve got the makings for every meaningful change that has ever occurred. So we believe in organizations, sure, but we also believe in THE POWER OF ONE. See, we think any one person with clear purpose has the power to change the world too… Except in order to do so, they need to do something. Know what it is? Gather more people together around that purpose. And that’s where Social Excellence and Dynamic Recruitment come in. EVERY PERSON IS AN ORGANIZATION WAITING TO HAPPEN. And in order for any person to make the change they want to make in the world, they need to to be SOCIAL! They need to be able to gather, organize, influence, and inspire others to take up efforts in support of their purpose. So look around. See anyone? You see, what could be the beginning of, a world-changing organization. Look in the mirror. See anyone? You see a single person who could be the beginning of a revolution. Nobody, and I mean NOBODY in your chapter knows more non-Greek first year students than your recently recruited new members. Many of you will be having your first new member meetings here in the next week or so. THE MOST IMPORTANT THING THEY CAN LEARN RIGHT NOW IS HOW TO RECRUIT! Mind Joggers: Add 100 additional warm leads to your chapter’s names list immediately. Do this exercise at the beginning of your first/next new member meeting… Give all new members a piece of paper and a pen. Tell them they have 60 seconds. It’s a race. All they have to do is write down the NAMES of all the non-Greek men/women they know on campus. Get ready, get set, go! After 60 seconds see who has the most names, and the let everyone know that they’ve only done round 1. For round 2 they’ll have about 2-3 minutes. During this time you’ll be reading some things called “Mind Joggers” to help them remember people they haven’t thought of yet… Get ready, get set, go! (Fraternity Mind Joggers, Sorority Mind Joggers). At the end, most of your new members will have 15-35 names on their Names List. Have them add phone numbers, E-mails, etc. Quick Call Session: The next step is where you turn that short exercise into real recruiting. Tell them for the following 10 minutes they have one simple job… Get 5 people they just wrote down on the phone with them and invite them to lunch, coffee, a pick-up football game, to work out, video games, shopping or any other small activity (fraternity small activities, sorority small activities) that has to take place in the next 72 hours. GO! If you do this, it is likely you’ve just created 50-100 small recruitment opportunities that will happen in the next 3 days, and it only took 15 minutes to do so. Now is the time of year to double down! You know which prospects scare me most? The ones with NO questions or concerns about joining the fraternity. I’ll take the guy that needs time to think through a lifelong commitment and asks for some help with a few personal concerns about membership. I like future members that take membership that seriously. But wait! That document is a fantastic free resource that we use all the time. However, it’s a bit like giving you a loaded pistol. You have to know how to use it. So, here are three techniques that will allow you to experience 100% bid acceptance using the “quality response guide” that you just linked to. 1. Preclose. We always ask this question days/weeks before offering a potential new member a bid, “If we were to offer you a bid for membership, what would you say?” The only possible responses are yes, no, maybe. Assuming your potential member offers an objection to membership, use the next two techniques along with your Quality Response Guide. 2. Bracketing. When he says, “I don’t have time.” Rather than trying to convince him that it doesn’t take that much time, try bracketing first. You might say, “I can appreciate the importance of managing your time. If time wasn’t an issue, is there any other reason why you wouldn’t accept a bid?” He might say, “I’m not sure I can afford it.” TIME TO BRACKET. You do not begin answering his concerns until all of his objections are on the table. You say, “Yeah, I can appreciate the money aspect. That was a concern for me, too. Let me make sure I understand. If we could figure out the money thing and time wasn’t an issue, it sounds like you’d be ready to accept a bid, right?! ?” If/when he says “yes,” you just BRACKETED his concerns. This has essentially locked him in by expressing to you that he’ll accept a bid if you can help him understand how to afford membership and fit the time commitments within his schedule. It’s almost time to use your Quality Response Guide, but not yet. There’s one more technique to use. In my opinion, a man that cannot shake your hand, look you in the eyes, and tell you he’s ready for membership BEFORE he gets his bid … does not get a bid. Use the techniques in this blog and you’ll get to celebrate 100% bid acceptance rather than stewing on why you couldn’t close those couple of kids that kept hanging out but wouldn’t make the commitment to join. THOUSANDS of organizational leaders around the country have received at least one of Phired Up’s Social Excellence Dare Cards this year. At many of our programs we either distribute them at the end of the session to continue the learning, or we’ll send groups of learners out into their communities to actually fulfill some of the dares within a short amount of time. 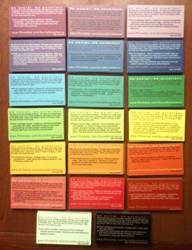 We’re excited that these Dare Cards are now available for purchase (click here). If your members have some of these cards (either from purchasing them or getting them at a Phired Up program), you can use them to keep teaching Social Excellence (and likely help your organization’s recruitment efforts along the way). Phired Up’s Social Excellence Dare Cards provide an innovative way to educate people in your life and members of organization’s in which you participate to practice the Social Excellence lifestyle. Share these business card sized educational tools with your organization’s members and challenge them to fulfill the dares. Partner members up and send them out on 60-minute challenges to complete as many dares as possible. Social Excellence is learned by doing, and these innovative cards provide a practical way to teach that important lesson to your members. These Dare Cards are great for retreats, preparing for membership recruitment, continual motivation, educating new members of your group on positive results-driving behaviors, and more. You’ll find 20 unique dares in each set of 100 Dare Cards. These dares have been carefully crafted to challenge individuals to push beyond their personal comfort zones and experiment with a Socially Excellent lifestyle. On a scale between Socially Excellent and Socially Awkward, where do you currently fall? What has contributed to your current level of social aptitude? What elements of Social Excellence are most important for you, personally, to develop? Who are the people in your life that already live a socially excellent lifestyle? Can you provide examples of how they do that? How could Social Excellence improve your life personally? How could it improve our organization? What was difficult for you while taking the dares? What was easy? What did you learn about yourself by taking the dares? What did you learn about others? What are some of the best “opening questions” to start conversations with strangers? Did these dares make it easier or more difficult to connect with strangers (compared to your normal days)? How important was your attitude or energy when trying to accomplish these dares? Why do you think these dares were really created? How can you incorporate Social Excellence (and the lessons learned from these dares) into your everyday life? At www.PhiredUp.com/SocialExcellence you can find further information about Social Excellence, links to blog posts that teach more about Social Excellence, and information about bringing Social Excellence training from Phired Up to your organization. Let me begin by first saying that I believe that sorority, when done right, can change people’s lives. I believe that sorority, when done right, can empower women to be better versions of who they currently are. I believe that sorority, when done right, can save lives – the lives of its members and the outside world. I believe when sorority is done right, it has the power to change the world for the better, to greatly impact humanity. I believe that in order for sorority to be done right, we first have to put the right women in those organizations. I believe it all begins with recruitment. I’ve spent most of my early fall, including the entire month of August, working with sorority women across the country, primarily to help them prepare for formal recruitment. Phired Up’s formal recruitment preparation programs however, are not what many people might first envision. We actually focus a large majority of our formal recruitment preparation training on helping sorority women understand how to be Socially Excellent in a formalized recruitment process: How to have meaningful dialogue, how to be confident, how to be authentic, how to be curious, how to be the best version of themselves. Above all, the actual process matters very little to what’s at the core of what recruitment is really about – building meaningful friendships, identifying high quality women, and turning those individuals into members. I’ve had great responses from the undergraduate women that I’ve worked with and countless examples of great successes these chapters have achieved as a result of putting the emphasis back on what is important in sorority recruitment: building meaningful relationships through authentic dialogue. However, all of this gleaming success and praise for our programming has coexisted alongside several disheartening incidents. During a few encounters this fall, more than I’d like to admit, I have talked with sorority women who don’t seem to understand the value of better conversations during recruitment. They can’t make the connection as to why they should care about anything other than physical looks, clothing, etc. They don’t understand why it would be important to discuss, among other things, the values of the organization and the expectations for membership. They only saw their organization as a social outlet and an environment that could provide for them prestige – because of the name or assumed stereotype of the organization. I found myself, especially in those incidents, frustrated and disheartened – feeling as though we will never make any forward motion if we continue to allow this mentality and behavior. So I wrote this blog as a way to demonstrate my commitment to that forward motion… I want to make clear my personal commitment to unapologetically putting my foot down and calling out this mentality and behavior when I see it. And I commit to changing it. What I am saying and am about to say may upset, offend, or shock some of you. Be certain that I am, myself, upset, offended, and shocked as well. However, I feel it’s important to draw light to this very real, very scary reality. I, as a proud sorority woman, understand that being a member of a fraternal organization comes with extra responsibilities and expectations. That when I took my oath to be a life long member, I promised to hold myself to a higher standard every day. That being a sorority woman does not make me better than you – it makes me better than who I was. I take my responsibility of being a sorority woman seriously and I get upset when others do not. Now to the part that might offend some of you – especially those select women I’ve worked with recently that realize I am talking directly to you: If you want to be an organization that is a bunch of pretty girls who party – great, more power to ya. Be a group of pretty girls who party – but don’t call yourself a sorority – be a club. Don’t be a sorority if you don’t want to live by the values your founders intended when your organization was created – be a club. Don’t be a sorority if you want get wasted, party hard, break rules, and act foolish – be a club. Don’t be a sorority if you don’t care about your academics, making an impact on the world, or being a leader – be a club. Being a sorority comes with extra responsibility and higher standards – if you can’t get with that – then don’t – no one is forcing you to – just be a club. Seriously, if you are not being a sorority woman (what they are supposed to be), but find yourself in something called a sorority… please quit. If you want to be a true sorority woman, then I welcome you to join me on the front lines of recruitment to find more women like us – women who want to be in a sorority, not a club. *If you don’t really know what it’s supposed to mean to be a member of your sorority – we recommend you look in your ritual book – your founders left the answer there for you. Over the course of this past summer I’ve had the opportunity to discuss and share different strategies and concepts with Matt Mattson, President of Phired Up. Together we’ve discussed how greek organizations at heart truly are grassroots organizations. We both agree Greeks need to realize we can’t get people to join our organization by just branding. We’re aren’t McDonald’s or Microsoft. Just because we throw our ‘brand’ and letters in front of a potential doesn’t mean they will want it. Sure, top of mind presence is good and having a cool branding looks nice and can be beneficial but as far as recruitment goes, branding just isn’t good enough. This article explains why. It’s not all about branding, it’s about relationships. One big problem most fraternities and sororities share is our continued effort to boast how perfect our organization is. Through that blinding pride we oversee what our potentials’ needs are. Could you imagine what it would be like if Greeks spent as much time creating quality relationships with potentials as they do trying to look unobtainable and perfect? I’ll explain further. Studies show that only about 15% of the average campus has students who show up on campus planning to go Greek. However it’s important to remember this number is comprised of some high quality prospects, but also students who are just wanting to party all day every day, so this percentage isn’t that promising. On the other hand, about 15% of students on campus are “never joiners.” This leaves 70% of students in the middle who are neutral. They are open minded about Greek Life, but aren’t actively pursing it. This means if they’re not looking for your brand, they won’t find it. We can either become completely consumed with an effort to battle it out for the 15% who are looking for us, or we can think strategically and creatively find ways to reach the 70% market. The bottom line is this: the only way we can recruit new members is for us to go to them. It’s about relationships, not the brand. Remember, you can’t recruit someone you don’t know. Here’s another example. Guess how great it is to have an incredible website? It doesn’t matter because no one will see it. The problem isn’t selling YOUR organization, it’s finding WHO to sell it to! We cant change a potential’s mind by being at the top of a google search or pushing our letters in front of their face. The only thing that can change their mind is sitting down with real people and having real conversations. Instead of talking about ourselves, lets listen to them, build a relationship around that and help connect them to our organization and what it will do for them. Now don’t get me wrong, branding is good and an online image can be a great tool as far as recruitment goes (especially for prospects who are on the fence). However spending time on ‘creating a brand’ with cool looking websites, videos and pictures is further down on the recruitment to-do list. When it comes to Greek Life, relationships work. Branding should probably not be your group’s #1 priority. Clark Buckner is an undergraduate student at Belmont University double majoring in Entrepreneurship and Marketing. Interests include video production and being a member of the Alpha Tau Omega Fraternity. For more perspective from undergraduate fraternity/sorority members, connect with Phired Up’s Ring of Phire! It’s been a while since I’ve written a book report for school, so when given the opportunity to share what I’ve been reading, obviously I will jump at the chance. I am a huge proponent of reading, and was extremely excited when Phired Up came out with a “Summer Reading List” earlier in May. However, while perusing my local bookstore this summer, I came across a book that caught my eye. In flipping through only a couple of pages, I immediately was sold. After reading the book about five times now, I’ve come to the conclusion that this should be on the “School Year Reading List” sponsored by the Ring of Phire (There is no such thing, but if you do want suggestions, e-mail me!). 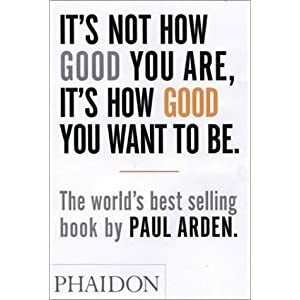 The book I want to share is entitled It’s Not How Good You Are, It’s How Good You Want to Be, by Paul Arden. This book, written by an advertising manager in New York City, is about the creative process of advertising and how it can relate to successful businesses. Well, I interpreted some of these lessons as the process of recruitment and development in order to create a successful organization, fraternity, or sorority. I am sure that everyone is busy with academic textbooks, organizations, work, and just life in general, but hear me out – this book is a quick read, no more than an hour, with a simple design, minimal words on each page, and even pictures (a nice break from college textbooks). However, if you don’t have time to read it, I’ve highlighted some of my favorite points from the book below. • Excellence vs. Mediocrity: Why would one choose to be excellent in a world where it’s o.k. to be in the middle? This is pretty much the backbone of Social Excellence. Sure, we can get away with just getting by, but where is the fun in that? Be challenged. Strive to be better. • “Don’t give a speech, put on a show”: This was a shorter part of the book that explained, well, exactly what it says. People get bored listening to words all day. It’s time to skip the tell, and move straight to show. If you’re trying to get some more new members, and your fraternity is awesome at intramurals, invite them to come play with you. Does your sorority do community service every week? Invite friends along. Show them what you can do. As the old adage says, actions speak louder than words. • Make your organization GREAT: Not just good. GREAT. This section of the book basically has a step-by-step outline for how your members can begin to take pride in the group and make it something to remember. I won’t give away all of the details (where’s the fun in that? ), but I will give you some hints: talk up your organization, behave how you would want your organization to be perceived (“like a winner”), and decide to be GREAT. Make the difference. My intentions weren’t to write a book report about recruitment and social excellence, but I think that is where I have been led. Being socially excellent is a choice that we all have – it’s something we are, or we aren’t, simple as that. But that “simple” choice can have amazing results. So, I’ll leave you with this – how good do YOU want to be? Earlier this summer I received an email with a pointless joke involving “horses.” While at first I laughed and didn’t think anything of it I randomly came across it again the other day and couldn’t help but see the relationship with recruitment. The tribal wisdom of the Dakota Indians, passed on from generation to generation says that when you discover that you are riding a dead horse, the best strategy is to dismount. Lowering the standards so that the dead horses can be included. Declaring that because the dead horse does not have to be fed, it is less costly, carries lower overhead, and therefore contributes substantially more to the bottom line than do some other horses. Harnessing the dead horse in a six-horse team, thereby raising the dead horse’s average output to equal the other horses in the team. Re-write the expected performance requirements for all horses. Now if we re-classify our dead horses as mules and think back to the ideas taught in Dynamic Recruitment I’m sure you’ll remember that “It takes a HORSE to recruit a HORSE. MULES tend to recruit MULES.” And we all know what happens when you push a mule… You’re bound to get kicked! Over the course of 2 years, my own chapter has evolved from one Recruitment Director in charge of all activities pertaining to recruitment, to a large committee of 7 people. Each person is put in charge of two smaller events, yet we also have a small group of 3 guys that strictly deal with setting up lunches with various potential new members to orchestrate a Pre-Close. Since we have taken this approach to our recruitment we have found that everything runs so much smoother and all we did was have our recruitment director sit down with our Chapter Advisor and President to pick out 7 “Horses” to make up our committee. We gathered our true horses, and got to work. Our chapter is successful because it rides its stallions. Should your chapter just start riding its Horses? Gather your horses, and get to work.